Yonks ago (meaning so long ago, I don't actually remember the exact year), I had my first foray with tinted moisturisers. What was in the market at the time was pretty limited and ordinary. It may have worked well as a moisturiser for keeping skin supple and moist but they all had an opaque orange tint that had me looking like an extra Oompa Loompa cast from Willy Wonka's chocolate factory. Bitterly disappointed, I abandoned my attempts on using tinted moisturisers - that is, until now. For the last 3 weeks I've been using Nivea's Q10 tinted day cream and I have to say I'm impressed (and that doesn't happen too often for me with skincare products). UVA & UVB sun protection - essential for preventing pre-mature lines. Sheer finish to suit all skin tones and give skin a radiant complexion. Contains co-enzyme Q10 - skin's natural anti-oxidant that helps prevent new lines and wrinkles while fighting existing ones by boosting skin's regeneration process and reduce free-radical damage. Light fresh scent that is not over-powering. 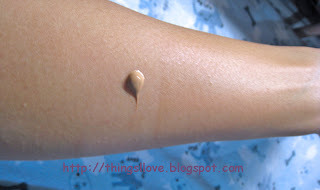 Cream comes out of the mess-free tube looking quite dark but the sheer tint really did blend perfectly onto my medium skin tone. No Oompa Loompas here at all. I think I actually let out a tiny squeal of delight when I found that the colour actually matches my skin. My days of avoiding tinted moisturisers are over! Blends effortlessly, is readily absorbed and gives skin a radiant look. There is a slight tacky feeling after application that is not unlike other day creams but it disappears within 5 minutes. I did not feel sticky residues or balling up here. Skin feels smooth and supple and does not grease up during the day. Perfect for those with clear skin - this could replace that sheer foundation for those who prefers a lighter coverage. Would have loved it to be SPF 30+ as I think SPF15 is only adequate for incidental sun and wouldn't really cut it if you were outdoors in full sun for more than 30 minutes. Although it protects against UVA & UVB, it probably did not have strong enough sun filters to gain the TGA's broad spectrum rating - something that would make it even more appealing to me. I deliberately didn't blend in the edges so you can see from the picture above the area my bare skin vs the area I've applied the tinted day cream on the right. As you can see, my skin looks more even-toned with a touch of glowing colour. My faith in tinted moisturisers has been restored by this day cream and I will be giving it a lot of love in the upcoming warmer weather - especially on those lazy weekends where I usually go without makeup but need something to even out my skin tone. I'm a fan of products that does what it claims and doesn't cost the earth. 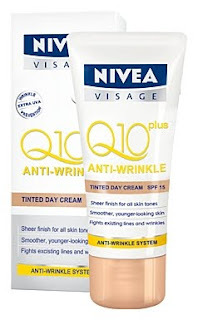 Nivea's new Q10 tinted day cream does both and is a definite must try item. You won't be disappointed - I promise. What is your favourite tinted moisturiser? Do you have any recommendations for me to try next? Rating: 9/10. RRP A$18.99 for 50ml at supermarkets, Priceline and leading pharmacies. Sounds nice, but the SPF 15 doesn't cut it for me either. I use ultraceuticals moisturiser with built in SPF 30 & just add a small dot of foundation, mix it up and make my own ad hoc tinted moisturiser.....works alright for the most part! Melbournite - I know, it's so hard to find any tinted moiturisers that is 30+ in the market. 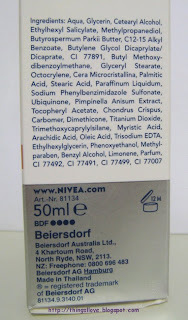 Something to do with the formulation and getting it to a consistency that consumers like is harder with higher SPF. I hope technology comes up with a good solution soon. I have used this product for a couple of months....its great ive ditched the foundation and use nivea cream for my foundation apply a bit of concelear where needed...bronzer and finish off with eye makeup......lip gloss! It looks great im in my early thirties and i have to say i have tried so many creams from avon products to clarins...and this one is Of the best! I dont know if i decided put foundation on top of this cream i may look like an oompa loopma!!???? But im happy with none for the time being..well done nivea! !